This post forms part of our ‘Garage to Granny Flat with GECA’ series – check out the introduction here! 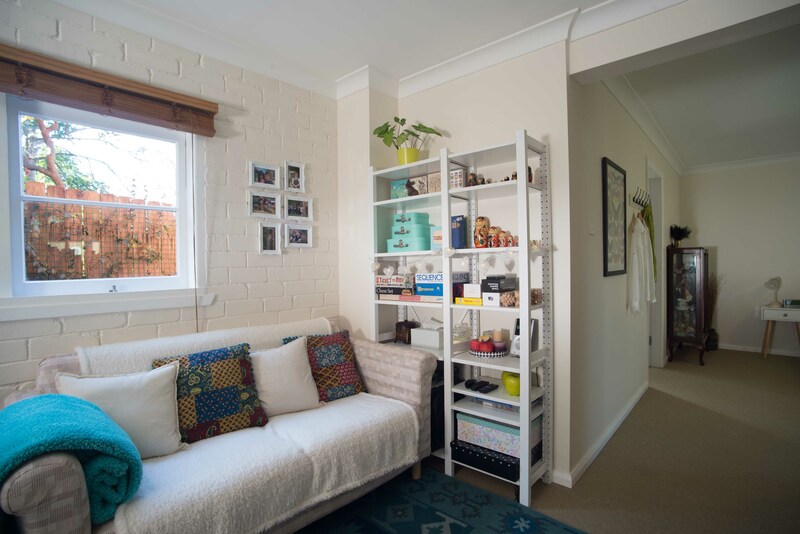 The overall goal was to have a plain, light and neutral colour scheme throughout the apartment to make the small space seem larger. The couple preferred slightly warmer tones such as creams and light browns rather than cool colours such as greys to lay the foundation for any interior decoration. Bright colours could then be incorporated in smaller details so as not to seem overwhelming in the 65-square-metre space. 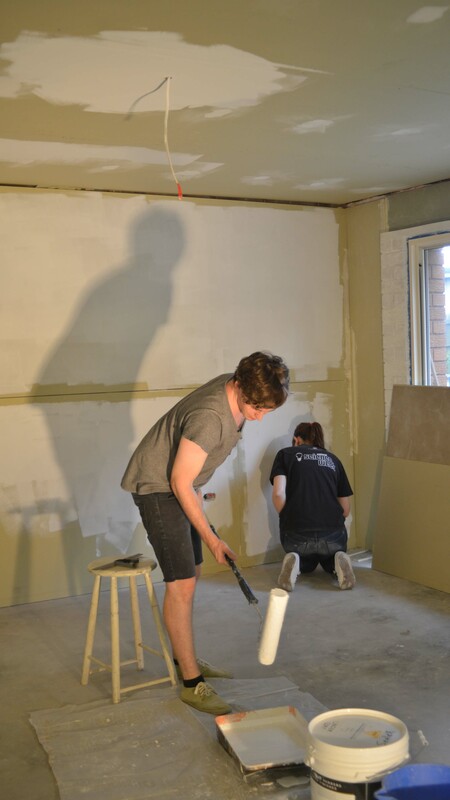 Emma and Andrew settled on a creamy off-white for the walls with white trim. After picking up some paint chips from a well-known range of paints, they approached ROCKCOTE Paints and asked for some EcoStyle paints to be colour matched to the chosen shades. The results were perfect. ROCKCOTE were able to deliver GECA certified EcoStyle Low Sheen for the bedroom and living room walls, as well as EcoStyle Satin for the kitchen walls, in the desired shade of cream. They also provided EcoStyle Gloss to paint skirtings, architraves and trims a clean white, plus EcoStyle Ceiling White and EcoStyle Sealer/Undercoat to complete the job. The paints were easy to work with and had almost no noticeable scent when dry. A couple of coats later, the space looked almost completely finished, save for the bare concrete floors. “The neutral tones are incredibly easy to work with from an interior decoration perspective, and we love how that particular shade of cream looks in our home,” said Emma. The paint proved highly versatile too. Andrew was able to use some of the leftover white paint to revamp some timber furniture for the apartment. “That helped us keep costs down and avoid waste as we were able to take some existing furniture, like shelving and some wooden benches, and turn them into brand new pieces that fit better with the style of the apartment,” said Andrew. The paint in those containers went a long way! ROCKCOTE EcoStyle paints are available on special order through any Bunnings store, even if they’re not kept in stock on the shelves. Most other stockists listed on their website can also supply the paint on request. Find out more about ROCKCOTE paint and render products.